The Calf of Man is a small island of the southern tip of Mann, to the southwest is Chickens (or Chicken) Rock, about 8,000 sq ft of bare rock which appears as two small islets connected by a low isthmus, all of which is covered to a depth of 6ft at high tide. The name Chickens is supposedly from the sea bird that frequents it, the Stormy Petrel, or 'Mother Carey's Chickens' though possibly it is an Anglicisation of the Gaelic Charrick y Challoo 'rock of the Calf'.. This menace to shipping rose from comparatively deep water into the middle of a tidal race which swept round the southern tip of Man and was capable of trapping a vessel and dragging it across the Chickens. 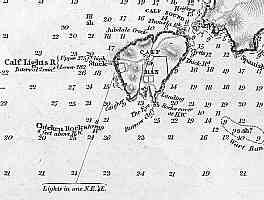 In 1794 a Mr Colquhoun suggested a double light so that it could be easily distinguished from that of the Skerries. This idea was adopted and the two lights aligned, as is clear from the chart, so that when they appeared one above the other then the Chickens rock was in line between the vessel and the cliff. 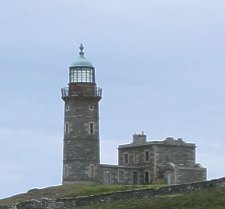 The two lights would appear as one when viewed from the rocks thus supposedly some estimate of the distance from the rock could be gauged. However one problem was that the higher light often (about 30% time) lies within the mist belt and thus the distance indication is not reliable. The two leading lights were designed by Robert Stevenson in 1816 and the station established in 1818. It comprised two towers, 560 feet apart, aligned to indicate a safe course past the dangerous Chicken Rock. 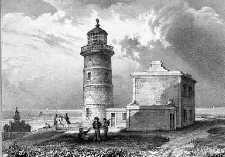 The two lanterns were 375ft and 282ft above sea level and held 'double revolving and leading lights without colour'. 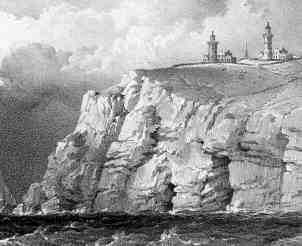 The station consisted of two circular stone towers with lightkeepers accommodation and was built with 10 months once the Duke of Atholl had agreed, after much procrastination, to rent the land. 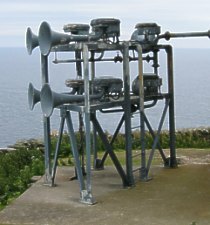 Discontinued in 1875 when the Chicken Rock light was established. The two lights were kept in synchronism by adjusting the clockwork drive. The old lights are now somewhat dilapidated and the handsome keepers' houses ruinous. A new station, near the old lower light, was established in 1968 following the fire on the Chicken Rock.. This is a 36ft, white octagonal tower designed by R.J.Mackay and built by R.J.Mackay & P.H.Hyslop.